Fate took me to Neighbor’s Deli. It seems that when I am in transition an eating challenge appears on my radar. While waiting for friends to show up at Cuco’s, I wandered by Neighbor’s Deli as I was pacing down the sidewalk looking for somewhere to sit. A friend had mentioned Neighbors to me a year ago. I added it to a very long to eat list I have on my laptop and it promptly forgotten. 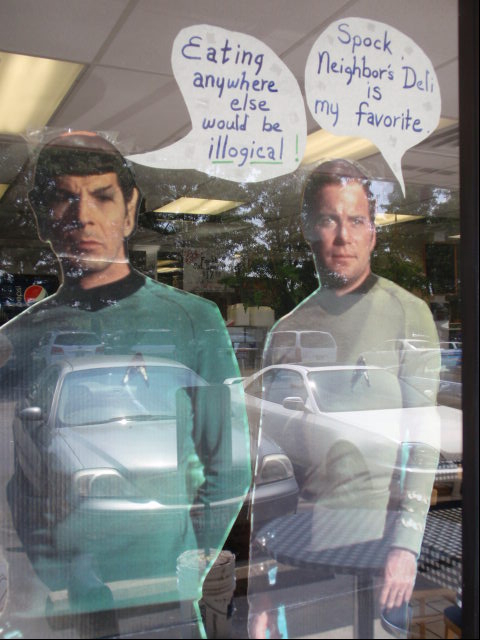 As I approached Neighbors Deli the images of Spock and Kirk on the window beckoned me inside to take a peek. I observed a large menu of appealing sandwiches. I looked for a carry out menu but could not find one. One of the owners was behind the counter working. He noticed me mulling about. After a bit of banter he told me he was out of carry out menus but he would make a copy of their catering menu if I did not mind waiting a bit. I did not mind waiting at all. I was in a holding pattern anyway. As the menu was being handed to me, I saw a sign about a Monolith sandwich. Hmm. I read about it and the long list of ingredients piled onto it. Then I spied the words that locked in a return trip: 4 and 1/2 pound sandwich, eat in 20 minutes and 11 seconds to get it for free. FREE. 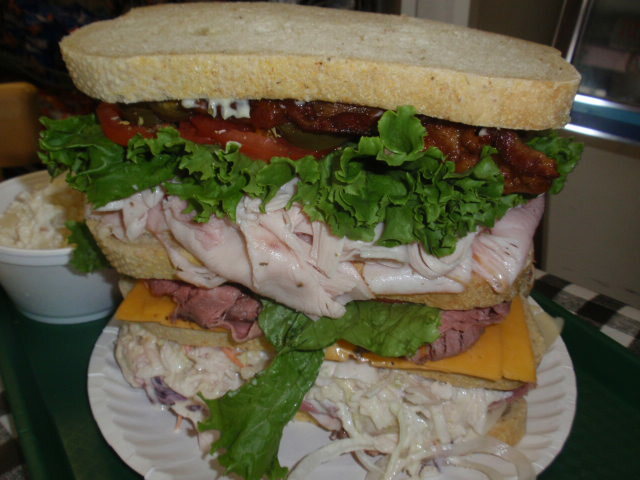 Large sandwich. Hmm, OK, yes. This reminded me of the Dagwood Challenge (I am a three time winner? of this). 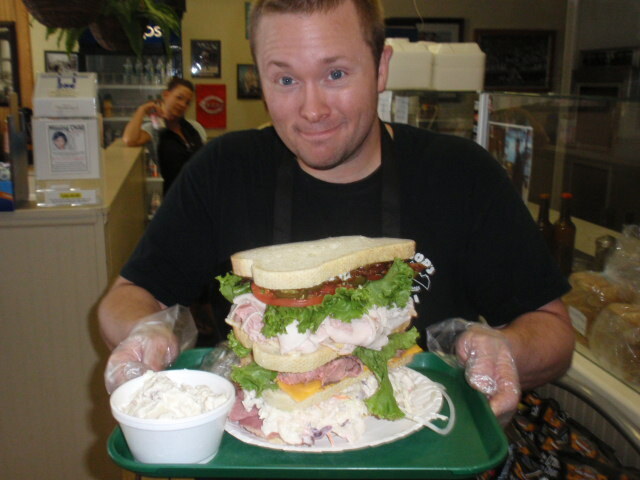 The Dagwood is 2 1/2 pounds of meat….that is hard to eat. The Monolith was almost twice the size. This seemed foolish. Yep I was in, but just for research purposes I told myself. I watched the sandwich creation process. It took at least 15 minutes to assemble. I was taken to my assigned table (the staff sets a timer and watches the sandwich eating so there is no cheating and only one table is suitable for this task). I snapped some photos, rubbed my belly once and said I was ready to begin. “Oh, hold on, wait, um, can I cut this in half first.” I wanted a cross-section photo and I wanted a chance to eat at least one half of this monstrosity, Monolith. I was given a knife for slicing. My cutting skills were so good I was offered a job on the spot (based on the fact I could cut a straight line through the Monolith without assistance or a power tool). ((I may take them up on the offer, simple repetitive work with lots of social interaction seems really appealing at the moment.)) Cutting completed, I gave the OK to begin. Again, I had stated that I was not going to finish the sandwich. However, I got off to a great start. The Neighbors crew and customers were getting excited….”He’s gonna do it”. I was eating at a very fast pace. The bread and the various components were really good. I picked off the tomatoes and onions and dissected the sandwich into smaller sandwiches. At the ten minute mark the first half was but a fond and filling memory, I had eaten 65% of the mandatory potato salad side and I had a decent start on the second half of this now just very large sandwich. I had gone mano y mano with the Monolith and had exceeded everyone’s expectations so far, including my own. The sandwich crafter was impressed with my efforts. He said, “you are doing great!”, “tell you what, you can skip the tomatoes……..keep going”. Even with ten minutes left I told him I was not going to finish the sandwich. 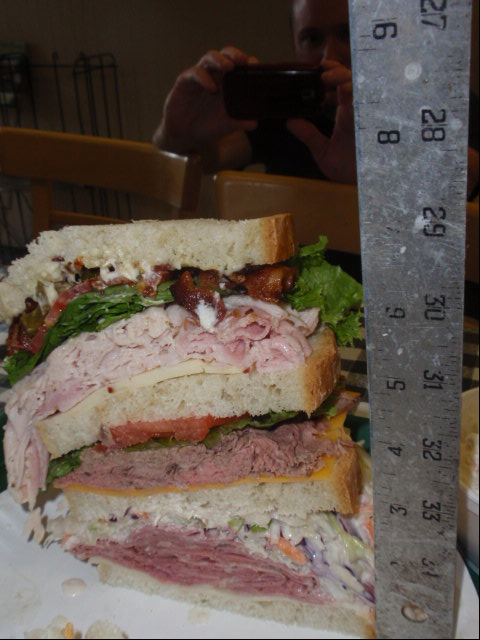 I took a rest for a minute then started picking at the other half (after we took a moment to measure the remaining sandwich – 7 1/2 inches and about two pounds). At the five-minute mark I was doing pretty well. If I ate very fast and pushed myself and my belly to points unknown I could have finished it. I was fairly sure I would be sick the rest of the day if I pushed on so with 24% of the sandwich left I threw in the napkin at the three-minute mark. Some may have looked at this as a failure. I looked at this as a victory – I chose not to be an absolute glutton. It also turned out I did really well. I am one of twelve people attempting the Monolith challenge. Only one person finished the sandwich to date. Of the remaining eleven, the Neighbors boys guessed I came in second or third for total consumption. Not bad for not trying. Before I walked out of the door I was given a handshake, an eleven cent discount on my sandwich and a Neighbors T-Shirt even though I did not complete the challenge. The guys at Neighbors have class. 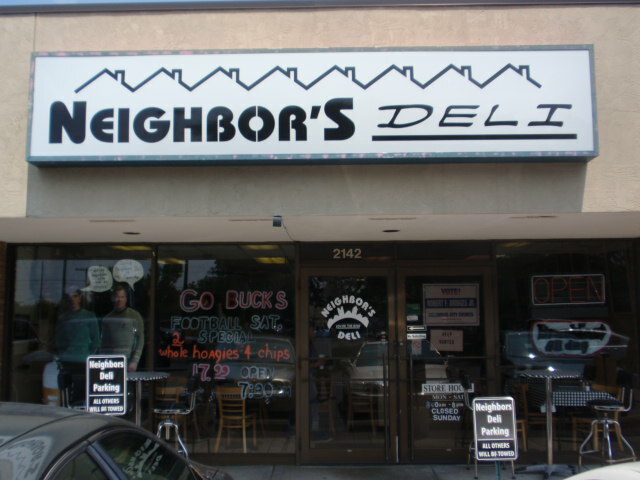 I will be back for some regular sandwiches. 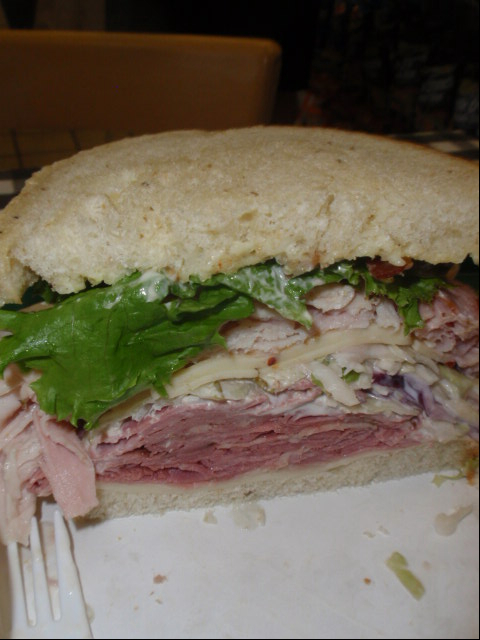 Someday in the next year I will go back and eat the whole sandwich. I know I can do it. I just need someone to drive me home after and a cold floor to hibernate on. This entry was posted on August 31, 2011 at 7:23 AM	and is filed under culinary misadventure, sandwiches. Tagged: Monolith Sandwich, Neighbors Deli. You can follow any responses to this entry through the RSS 2.0 feed. You can leave a response, or trackback from your own site. Great post and at a great time. I just learned they are doing a fundraiser for ADD through Sept 9 and I am excited try them out! Excellent! I volunteer to drive when you decide to take on said challenge but let me get many blocks away after drop off before you drink that beer…. I have visions of Monty Python & Mr. Creosote plus a wafer thin mint!!! Welcome back Jim! We’ve missed you. That Monolith sandwich could feed a family of four! Thank you for sharing this. Having conquered the Dagwood last month, I welcome this previously unknown challenge. In my own backyard, even! I’m one of the owners, and Jim did exceptionally well. I shudder to think of him trying again, but we’re due for a defeat. When he had less than half to go with thirteen minutes left, I thought we had lost. He just hit the dreaded “food wall”. Stretch that stomach with a big jug of water the night before. That’s my best advice. Jim, my friend, you are a total f’in maniac. 🙂 Welcome back! I can’t promise to trying the Monolith, but I’d be honored to have you make me my first Neighbor’s sammich. 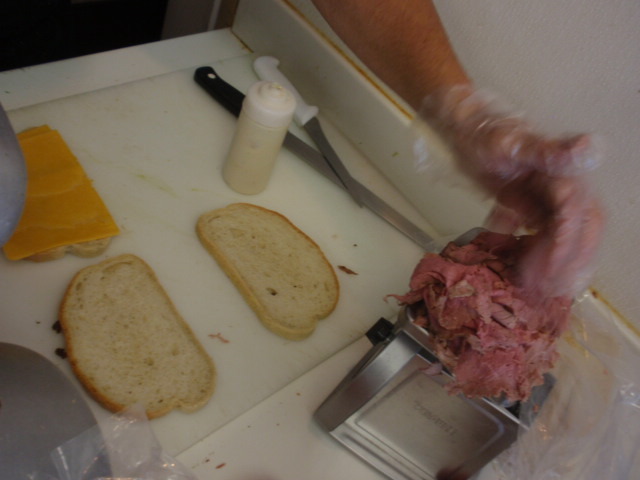 Jim – glad you made it there – Jon-Michael is a good guy and makes a rockin Reuben and spicy Mac-n-cheese. Sounds like you will get it on your 2nd attempt! Excellent play by play! Glad you’re back at it.